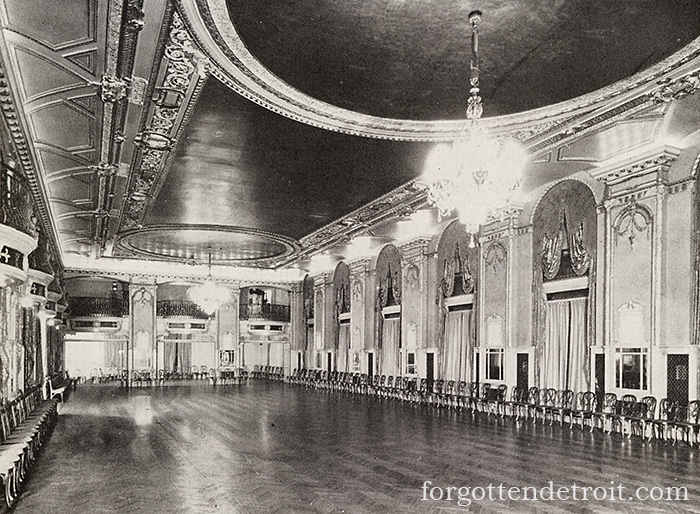 I’ve previously written about the Book-Cadillac Hotel’s general restaurant service. Today I’ll show off the three patterns used in the hotel’s ballrooms and private dining rooms. The hotel could host dinners and banquets of a massive size, so you would think that this china would be the most common. Oddly enough, that is not the case. First up is the standard banquet service. This is the pattern that was used for most private functions, regardless if it was hosted in the vast ballroom, or one of the smaller private dining rooms. Given its use throughout the building, it could not be made to match the decor of any one space, and thus is considerably less ornate than other patterns save the Coffee Shop. But I’m getting ahead of myself. I only have a few examples in this pattern, the bowl shown above being my favorite. The Cadillac crest is the dominant feature. A burgundy band framed by two thin gold bands makes up the rest of the design. I don’t find banquet service very often. And of those in my collection, the bowl is in the best shape. Pieces are frequently beat up, which is not at all surprising, given the nature of their use. The regular banquet service is all well and good. But clearly the Book-Cadillac management thought what was good for the general public was not good enough for certain occasions or special guests. Therefore, they ordered two additional services to be used whenever the best was not good enough. Two differences stand out. First, the decoration is more exquisite. Second, the two patterns are both made of bone china. 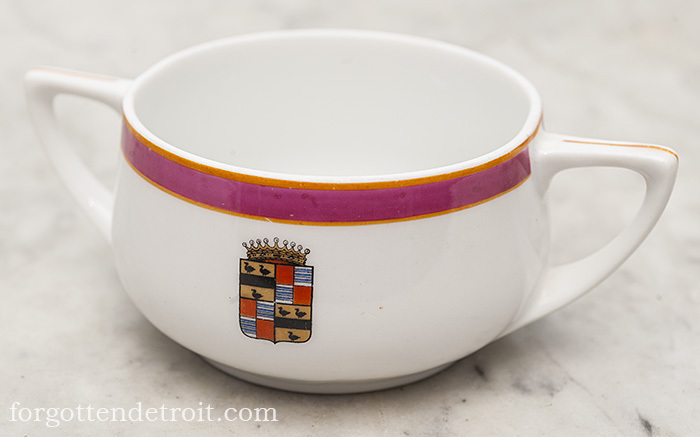 They are thinner and more delicate than the heavy-duty restaurant ware used for all of the hotel’s other china. These pieces are so thin they are semi-translucent when held up to light. 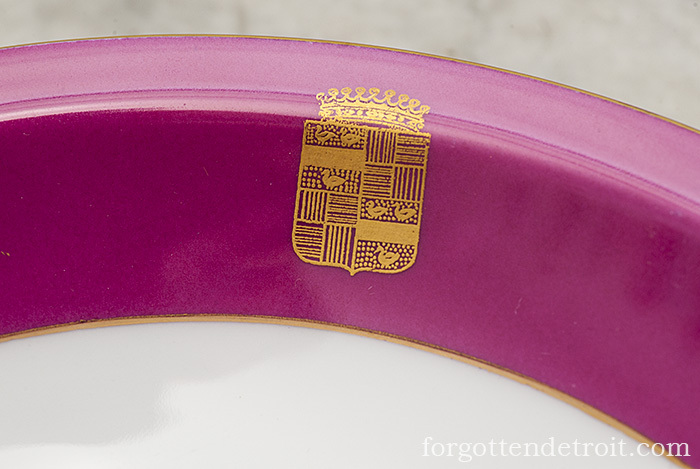 The first of these special patterns was produced to serve a mere 125 guests, making it quite rare. It has a thick rose band around the edge with gold leaf highlights. 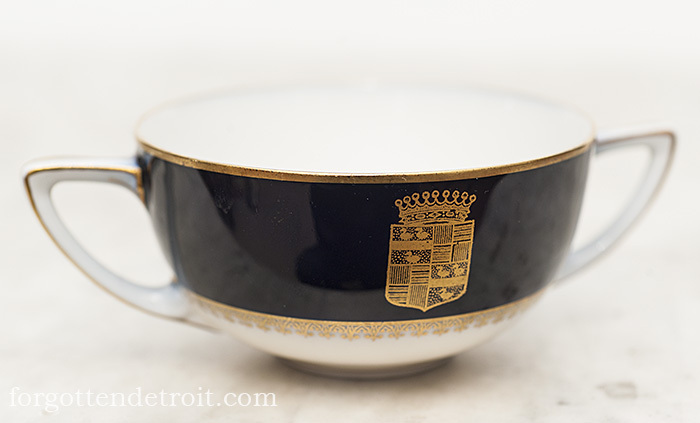 The Cadillac crest also appears in gold leaf. Overall, this pattern resembles a spiffed up version of the general banquet service. But only the elite get the gold leaf. Of all of the Book-Cadillac china patterns, this has proven the most difficult for me to track down. The second pattern, produced to serve only 100 guests, is similar but more elaborate. Cobalt blue replaces the rose color. The design is spruced up with the addition of lace in gold leaf. 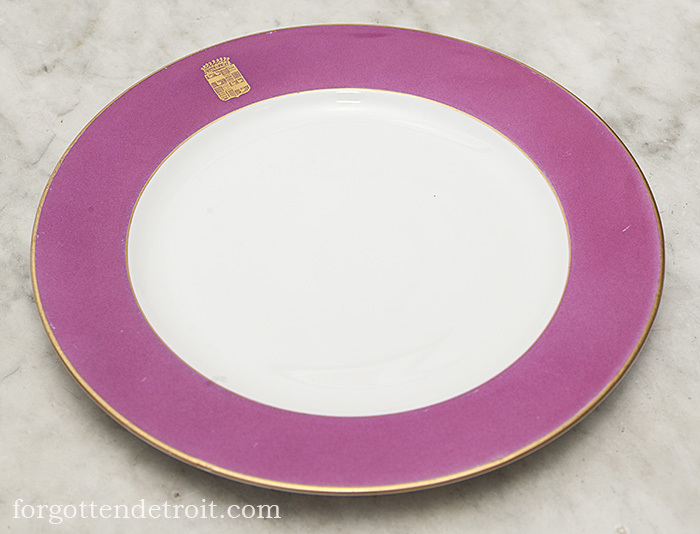 This is my second favorite pattern from the hotel, after the “Robin Hood” china from the English Grille of course. It is just so elegant. And the gold leaf really stands out against the blue. 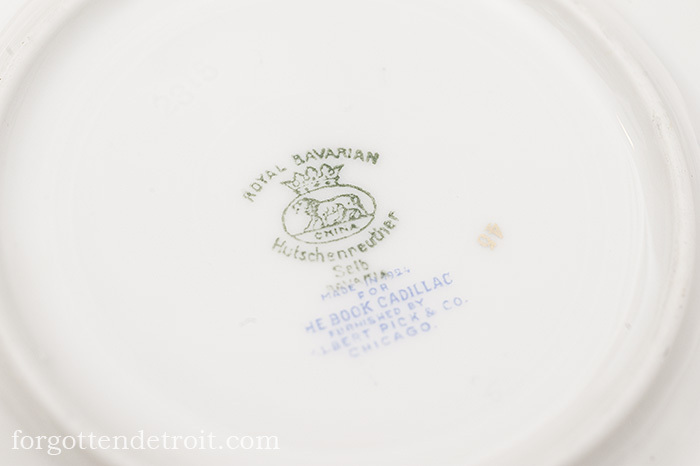 As with the general restaurant service, all three banquet patterns were produced by a German firm, the Porzellanfabriken Lorenz Hutschenreuther AG Selb, and supplied to the hotel by the Albert Pick Company. At least, that is the case during the 1920s. I have a plate from the general banquet service made by Shenango China of New Castle, Pennsylvania. This piece is undated, but my guess is that is from the 1940s. The original service from the 1920s was always dated. 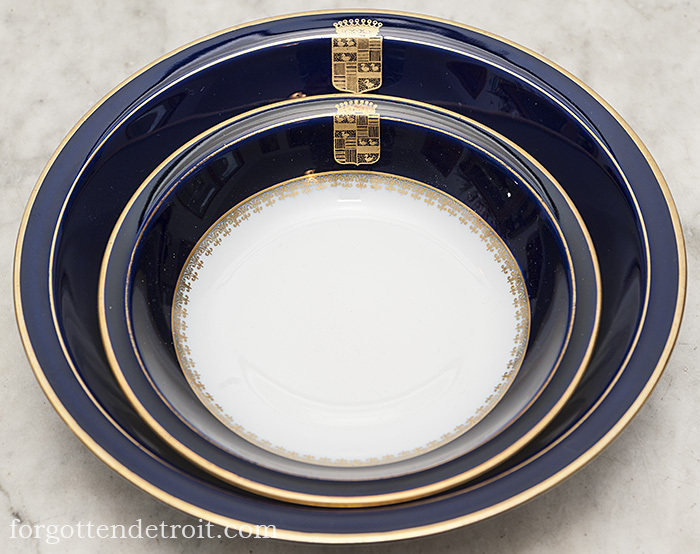 It is my understanding that the three patterns remained in service until the Sheraton era began in 1951, at which time they would have been replaced with Sheraton-branded pieces. Have you given up on the blog? I have greatly enjoyed it over the years, but I notice the frequency of new additions has dropped significantly. . .
My name is Dan. I grew up on the east side in the 50s and 60s, in Highland Park, Hamtramck, and near the State Fair grounds. I’m a sociologist now semi-retired and my next book is about Detroit. I do not focus on “what happened” questions; rather I am interested in “what comes next?” for the city and its residents. The tentative title of the book is, “Competing Visions of Detroit’s Future: An Ethnographic Account.” My last book was released a year ago,”East German Intellectuals and the Unification of Germany: An Ethnographic View” Palgrave/MacMillan). Here’s a link to a lecture I gave in Nov. 2106 on the book: https://www.youtube.com/watch?v=1n__bU5h6Os&t=2350s. I’m coming to Detroit March 12-16 to begin research on the book. I’ve read your blog and would like to meet you for an informal interview/conversation. If you are interested please get in touch.